Who are we to argue about the proper way to serve this classic Portuguese dessert? Go on, try these Portuguese coconut custard tarts straight up without the jam. Then try them David’s way with the jam. (Not because he’s our boss. Because he knows what he’s talking about when it comes to all things Portuguese.) And then let us know what you think in a comment below. 1. Preheat the oven to 375°F (190°C). Adjust the oven rack to the middle position. Line a 12-cup muffin tin with 10 paper cupcake liners. 2. Dissolve the cornstarch in 1/4 cup milk. 3. In a food processor, shred the coconut flakes for 30 seconds. 4. In a large bowl, stir the eggs and sugar together with a wooden spoon. One by one, add the cornstarch mixture, the remaining milk, the coconut, melted butter, and lemon extract, stirring well after each addition. 6. Bake for 25 to 30 minutes, until the coconut is nicely toasted. Cool completely in the muffin tin before serving. This recipe is really good. My daughter refused to share them with the extended family. Moreover, we waited for these to cool ever so slightly on day one and then just ate them plain. That afternoon we tried some with jam. The last couple days, my daughter has been eating them both with and without jam. Jam or no jam, these are delicious. The verdict is that this recipe is easy and fantastic. Serving these tarts a little bit warm is better than completely cold. Note: Look closely at the picture. There is a little dip in the top. The recipe is a custard with no flour to hold it up structurally, so there is definitely a place for jam (hence the accurate use of the word "tart"). 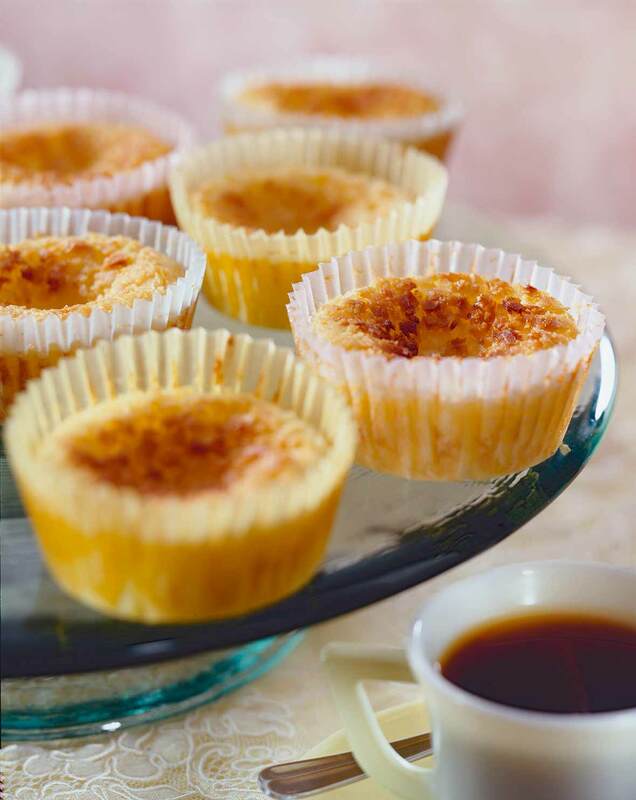 Portuguese Coconut Custard Tarts Recipe © David Leite. Photo © 2001 Steven Mays. All rights reserved. All recipes and photos used with permission of the publisher. i made this recipe and it was go good, thank you so much for doing this recipe in English. I will be making this recipe for the holidays for my family from Boston, MA. Hello Chris, so glad you liked the dessert. One thing I sometimes do is but a little strawberry compote in indentation. A nice contrast. I just wanted to get back to you and say that the tarts were sooooo good the following day. On second thought, the indentation doesn’t bother me anymore. I will try it with some contrasting fruit the next time I make another batch. Raspberries are not available here so I will try it with some fresh mangoes, which are in season this time of the year. Thanks for sharing this wonderful recipe! Trish, hear that? That’s the sound of me clapping and whooping it up! So glad the recipe worked out for you. David, the ones I see at the Portuguese bakeries have a piecrust type shell and no paper, and the coconut shell is different than the custard shell. Bob, yes, there are so many different types of Portuguese tarts: bean, orange, cream, coconut, etc. This is my aunt’s version. I’m not sure if there’s no crust because she’s not adept at pastry! I love the flavor! And yes, I also couldn’t decide if its a custard, pudding or a really soft macaroon. One question though, why does it seem to deflate once taken out of the oven? Is there something I can do to prevent this? So glad you liked them! The indentation in the middle is traditional; it’s how I’ve always seem them. A friend does a very clear thing and puts a dollop of raspberry coulis in them. Lovely. Actually, the jam was the idea of my friend Lois–a dyed-in-the-wool Southerner! i would like to know if i can bake coconut custard tarts without the papers? Ana, the tarts can be very sticky, which is why my aunts use the papers. If you want to try, I’d suggest starting with very good nonstick tins that are well coated with butter and see if that helps. Hi Ana. Yes, you can make them without the paper. I do it all the time because I tried with the paper but they kept getting stuck and it was a mess. I use silicone muffin trays which I spray with nonstick vegetable spray before I fill them in I place it on a baking sheet which is about 3 inches high and fill it with water and bake for about 25 minutes at 300 degrees. When it is cooled off I place a plate over the tray and flip them over and give a little tap on each and they come right off then I put then in muffin paper and vola they are ready to eat. I hope this helps and enjoy I know my whole family loves them. These tarts are great. They’re delicious and so easy to make. With regards to your note to stir the mixture frequently to keep the coconut well distributed, I found it difficult to do and so I tried a different approach. I did not mix the coconut in the liquid mixture and simply divided it equally into the paper cups. Then I ladled the liquid mixture into the cups with the coconut. I found this easier to do and it seemed to do the trick. Thanks again for sharing this recipe! Hello, John, thanks for the kind words. And thanks of the ingenious method of adding the coconut. My only caveat is that the coconut shouldn’t be wadded up in the middle. Does it float and even distribute when you add the egg mixture? Hi David, I think either way the coconut will sink and there’s probably nothing we can do about it. I just find it easier to divide the coconut more evenly without than with the liquid ingredients :-). Ah, I see. Well, then, divide away! Ever make these with mini baking cups? Any caveats? Adjusted baking time? Hi, Elise. No, I’ve never made these in mini-form. I would watch for a few things: 1.) Not to fill the forms too much, 2.) Check them at 12 to 15 minutes to gauge how much longer you’ll need to bake them. (I’m guess about 18 minutes total), and 3.) keep them covered when cooled, as they might dry out quicker because they’re almost half the size of the original. Made this recipe today and it couldn’t get any easier! Instructions are clear as day and super easy to follow. I also made a raspberry coulis to see what the fuss (David) is all about…my eyes (and mouth) are open! Ms. Sparks knew what she was talking about. Taste test: Here is another one of David’s recipes where I found myself at a loss for words…until three tarts later when my mouth no longer contained all that fresh goodness. These little guys are so delicate, light, and the coconut took them over the top. Such a simple dessert yet it ranks right up there. I dare anyone making these to stop eating at just one…go ahead, I dare you! These were not only fantastic, but also incredibly quick and easy to make. I made a raspberry coulis as well and it was the perfect touch. Highly recommended! Muto obrigado, Laura. Estou emocionado. Hi, I’m just curious if these are the same as my mother-in-law makes. I’m not sure how to spell the name we call them in English , but kashadas would be close phonetically. Nata is just a milk or cream tart and then some have coconut, my favorite. However hers, and every other I’ve had, have a very thin crust. So thin you wonder is there a crust? But Ive watched her make them before and sure enough there is. In our community making these well is like a gift from god and has always been off putting. Thank you for what seems to be an easier way. I can’t wait to try!! So I’ve seen some discussion as far as what the best baking pan is, what’s your preference? Thx. Karen, I think the word you’re looking for is queijadas, pronounced kay-jah-dizhs. And, yes, I’m pretty sure they’re the same. Some do have a very, very thin crust, but my family makes the in paper muffin cups. Because of the cups, the pan isn’t terribly important. A simply muffin tin works perfectly! Thank you for posting this. As a child in the military we lived in the Azores for about 4 years. Our wonderful neighbor taught us how to make these wonderful tasty treats. We had the recipe for years and had converted it from metric to standard ourselves which I can say is a chore. Of course our recipe was triple this recipe calling for a dozen eggs! But sadly due to many moves over the years and just loss of memory I lost the recipe and was saddened to not have made these at Christmas time. So thank you again, now I can have my sweet treats this year! One thing I would like to note tho is that when our neighbor baked them for us and even in her recipe she used phillo dough and not cupcake papers. This makes a huge difference as you get a nice crisp on the outside as well. Although a warning the bottom will get sticky after a day. Anne, I’m so glad you found the recipe. Yes, some cooks use phyllo dough for the recipe. Barring that, a sheet of very thinly rolled dough works well, too. I don’t know why my aunts don’t do that. Perhaps they enjoyed the convenience of the paper cups when then emigrated! Hey David, the Portuguese NATA aka queijadas are totally different then this coconut custard cup. I am of Portuguese decent, not that it matters, but so u know we have grown up on both pastries in our household, the queijadas have a thin puff pastry type dough on the bottom and the custard u fill it with you cook stove top before adding it into the dough, then baked in the oven. Those if you find a amazing recipe or the best Portuguese bakery be ready for a whole other taste , they have no coconut in them at all. I highly suggest u go to New Bedford or Fall River and stumble across all the sweets. now if you choose New Bedford you need to stumble into Sunrise bakery or Lydia’s bakery, that’s Portuguese at its best. Enjoy I hope you will really try. Hi christina. I, too, am of Portuguese descent–from the Azores. My family is from the island of São Miguel, from the towns of Maia and Ponta Delgada. I also grew up in Fall River and spent a lot of time in New Bedford as a kid, so I know of the treats you’re speaking. This recipe, which I don’t call queijadas, is from my aunts. Pastéis de coco is what they called it. They prefer not to use the thin crust, opting for the paper cups when the came to America. What I learned when I wrote my book and spent the better part of a decade traveling all over Portugal, Madeira, and the Azores is that there are a million different names for the same dish. Take torresmos. Im my family, they’re big chunks of pork, covered in a pepper paste and roasted. Others call pork preserved in fat torresmos. And still others, around the Bairrada region on the mainland, call pork cracklings torresmos. The term “queijada” is used very indiscriminately these days to mean just about any treat, crust or no crust, coconut or not, made in a “forma.” Of course, that is with the exception of pastéis de nata, pastéis de feijão, pastéis de limon, etc. Oh my gosh, they are perfect! My husband has been in intensive care at the hospital for 8 days. I was in need of some comfort food when I saw this recipe. I had all the ingredients in the house. I made a batch and ate two immediately. They were delicious! karen, first, I’m so sorry about your husband. I hope he’s recovering nicely. Second, I’m thrilled you like these. My aunt is delighted! These look fabulous. Coconut desserts are one of my soft spots. Thank you so much for posting! I don’t know what size cups you are using. It looks smaller than the reg. size cupcakes. Can you please let me know what size you use. Thanks. Hi Lucy, they’re regular-size muffin cups. They look smaller because they stay with in the height of the paper cup itself. Happy Valentine’s Day! David, these look super good! custard and coconut a sure fire winner. In Hawaii it’s not Fat Tuesday but Malasada tuesday! Long lines at Leonard’s malasadas. FYI there’s a malasada dessert recipe of Chef Mavro you can get by googling Chef Mavro’s Lilikoi (passionfruit) malasadas with ice cream. It’s one of his signature recipes and his eatery is a James Beard winner so it will be good. Check it out. Thanks, Ann! I love Hawaiian malassadas. The One and I had them when we vacationed here. Thanks for the link information! Hello, thanks for this great recipe, which I’ve made many times since its original posting. It’s been at least a year since my last attempt, and I can’t remember if I modified it to use unsweetened coconut (I don’t care for very sweet desserts and often do this with little change to recipes). Do you know in this case if it would dramatically change the texture? Terri, so glad you like them. If the coconut is shredded, there should be no difference in texture. It will, of course, be less sweet. David, these are beyond wonderful. My 11-year-old grandson inhaled his and his mom and I weren’t far behind. Yum! Jean, that is wonderful to hear, thank you! Now, teach him how to make these, and he’ll always have a fresh supply! Hi, David, do you think these could be made in 4 oz ramekins? Thanks. Mary Ann, they could be, but that’s a bit big. Plus it would be hard to get out. I added 1/4 tsp salt to this recipe, but I otherwise followed the recipe to the letter. This was so good… there are no words to describe how over-the-top fabulous these are. If you’re considering trying these, you should. What a find. I cannot wait to make these for my mother-in-law for her birthday. I was thinking of preparing them in the mini cupcake trays so that they are more bite sized. I imagine I would have to cut down the baking time but just wondering if the smaller size would affect the texture. Lora, it’s shouldn’t Just make sure to stir the mixture often. And, please, wish your mother-in-law happy birthday for me! Thank you for this!!! I tried these last week on a whim with a bunch of leftover coconut and am a huge fan. My husband loves coconut and also raspberry and was in heaven – thank you so much for sharing this! I was wondering if you have a recipe to share with us for Queijadas de Laranja? As they are in the same vein and you seem to be such a reliable and delicious addition to my baking vault I’d love to try a version of your Q.D.L. if there is one available, or if you could point me to one that is reliable and also traditional. Eliza, so glad you liked the recipe. I, too, am nuts for coconut. I don’t have a recipe for queijadas de laranga, but my friend Maria Lawton might. Thank you so much David, I will check it out. Cheers! 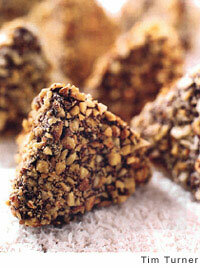 I’ve made them twice and they are crumbly have to use a spoon to eat them they break up. Hmm, Fatima,they shouldn’t be crumbly. They should be moist. Not sure what I did wrong, that being said, they taste great. No depression in the center. I found parchment paper liners and did use a water bath. They do not stick to the liners. Thanks for the recipe. Will definitely make again. Berni, well, I don’t know what you did, but I have always wanted not to have the depression or the sticking. So you made my perfect pastéis! Steve, excellent news! And I like the way you’re thinking, with the cocoa nibs and cherries. valerie, so happy you enjoyed these. We keep them in an air-tight container at room temp. Hi! I made this yummy recipe and it’s so good…but my custard tart didn’t end up custard-y. Lysette, the tarts aren’t custardy the way the pastéis de nata are. It’s more like a soft macaroon. I made these last night for a quick dessert. Delicious! I cut the sugar to 3/4 Cup. They seemed to be a bit greasy in the paper liners, Does the coconut release oil? Two tablespoons of butter didn’t seem like much. Anyway, they were tasty! Linda, hmm. Not sure why they were a bit greasy. What kind of coconut did you use?